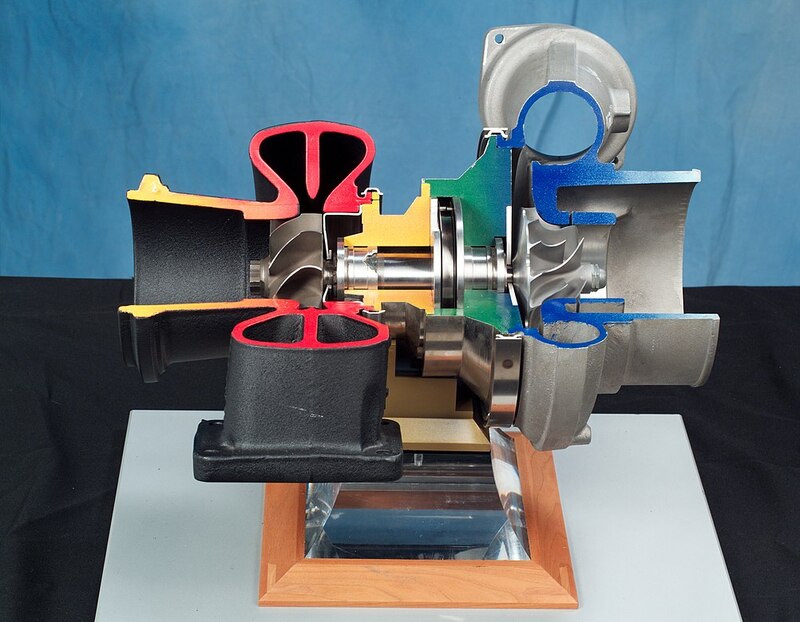 A turbocharger is basically a small turbine that acts as a pump. The turbo itself can vary in weight as it also varies in size, however a typical road car unit can weigh in the region of 15-25kg. The mass of the entire system can be weigh as much as 30kg or even more. The turbo is composed of two channels: the exhaust inlet and the compressor inlet. Each channel contains one section of a turbine. In the image below you can see a cutaway of the turbo unit, showing the turbine running through the two channels. The turbine rotors are connected via a shaft on a bearing system, with oil passing through the system to provide lubrication. In a naturally aspirated engine fuel and oxygen undergo combustion in the cylinders, creating exhaust gases at the end of this process. The gases then pass through the exit valve, through the manifold and out of the car via the exhaust exit pipe. Installing a turbo is a great way of boosting a car’s efficiency and performance as it takes advantage of these wasted gases. After the exhaust manifold a turbo unit can be put into the network, passing the exhaust gases into one of the channels which contains one section of the turbine. After the exhaust manifold, the pipe network converges exhaust gases from multiple cylinders into one pipe, so there is quite a large volume of gas passing through the pipe at a relatively high velocity. Such is the energy of these gases that they can drive the turbine in the turbo unit. As the two turbine rotors are connected via a shaft, when one is turned so does the other. When the exhaust gases pass over one of the rotors – turning turbine in the process – this in turn spins the rotor on the compressor side. Once the gases have passed over the rotor in the exhaust channel they are then discharged, sent to the exhaust pipe and exit out of the engine. The compressor channel rotor is open to the surrounding air. The spinning motion of the rotor generated by the energy from the exhaust gases forces air into the compressor inlet. This air is then sent through the channel along another pipe network to the air intake valve in the cylinder via an intercooler. Additional airflow combined with the fuel results in a better combustion and therefore extracts more power out of the engine. As more exhaust gases come through the system as engine speed increases, the speed of the turbine also increases. In some performance cars the turbine can spin at over 240,000rpm although next year’s F1 V6 turbos will be limited to 125,000rpm. Exhaust gases can be in excess of 900 degrees Celsius as they enter the turbo, so building the system out of heat resistant materials is essential. If the heat from the gases is not dealt with correctly, there are a number of issues that can have an impact on the performance of the car, including reducing the life-span of the turbo unit itself. The air can rise to temperatures of up to 250 degrees Celsius as it passes through the compressor intake of the turbo. Incredibly, this temperature rise is mostly due to the compression of ambient pressure airflow into a high pressure region inside that is the compressor intake pipework. Other than that, the shear heat from the exhaust gases passing through the exhaust channel in the neighbouring chamber also heats up the air slightly. 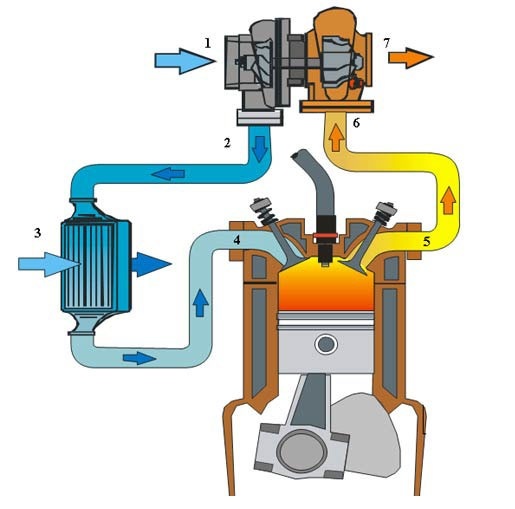 To extract maximum power from the engine, cooler air is favoured over hot air as it is denser. Denser air is packed with more oxygen molecules and therefore more efficient combustion occurs within the combustion chamber, providing more power. How do you cool 250C air before it reaches the cylinder? Using an intercooler. An intercooler is, effectively, a miniature radiator placed between the compressor intake and the air intake valve for the cylinder. This reduces the temperature of the compressor intake air, allowing for a greater power output as fuel burns more efficiently. 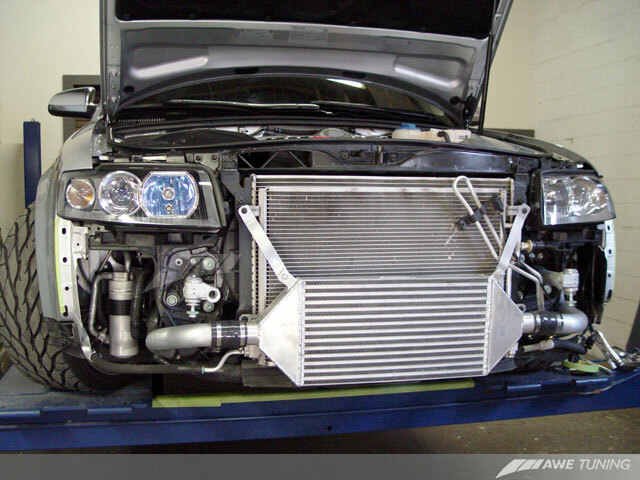 There are two types of intercoolers: air-to-air and air-to-water. Air-to-air refers to oncoming airflow passing through the intercooler, cooling the hotter airflow – that originates from the compressor intake of the turbo unit – on its way to the cylinder. Air-to-water is slightly different in that oncoming airflow is used to cool a water bath, in which lies the pipe that passes hot compressor intake air to the cylinder. Another small consequence of hot air from the compressor intake is engine knocking. If hot air enters the combustion chamber the fuel can ignite, even if the spark – produced by the spark plug – is inactive. This causes engine knocking which can cause cylinder head and piston failure within the engine although this is only occurs at extreme air temperatures. Performance turbo engines are slightly less predictable to drive than naturally aspirated engines as the turbo provides a “boost”. At low engine rpm, little exhaust gases are being produced and therefore the turbine rotates much slower. This reduces the air intake into the cylinder as the exhaust flow is providing little energy to drive the turbine. As engine speed increases, the turbine rotates faster and therefore power output is almost exponential. If a large volume of exhaust gases are travelling through the turbo system, it can over-boost the engine by spinning the turbine too quickly. This can be particularly problematic in wet conditions as there can be power surges that can catch the driver out. 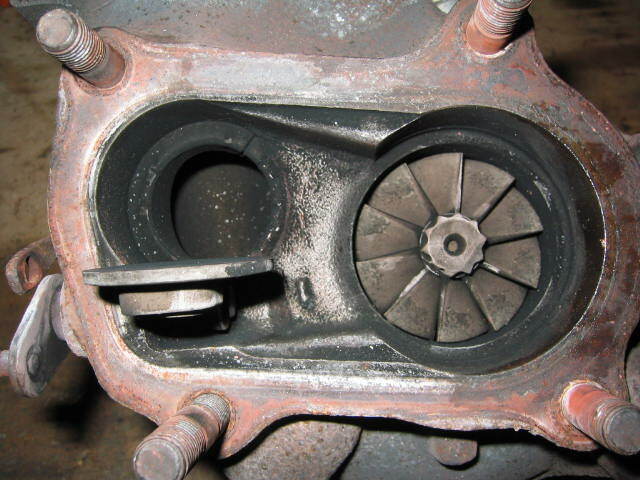 To reduce this problem, the turbo is fitted with a waste gate. A waste gate is a valve that allows the exhaust to bypass the turbo once a certain pressure is met within the system. This excess exhaust then travels into the exhaust pipe and exits the engine. Having a waste gate allows a smaller rotor to be used in the exhaust channel of the turbo unit. This is because a large volume of exhaust gases needs a larger turbine to not over-boost the engine at high rpm. A smaller rotor allows maximum power output to still be achieved whilst also reducing weight. Engine response is also increased as a smaller rotor has a smaller inertia, allowing the turbine to accelerate more quickly, driving air through the compressor and into the cylinders at a faster rate. Low engine rpm and/or larger rotors can cause “turbo-lag” as there are not enough exhaust gases to drive the turbine, reducing power output. One of Ayrton Senna’s most renowned driving techniques was to blip the throttle mid-corner, passing exhaust gases through the system, spooling the turbo and therefore reducing turbo-lag as he exited the corner. Next year’s F1 turbos will not include a waste gate. More on this in my 2014 power units post later this week. 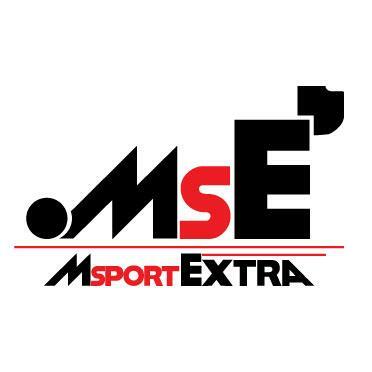 This entry was posted in Analysis, General and tagged 2014 Rule Changes, f1, intercooler, technical regulations, turbo, turbocharger, V6, waste gate on December 4, 2013 by thewptformula. Thanks for commenting. This is a general summary of turbos but my F1 turbo post will be up this weekend which will highlight this, although I’m unsure how it works at the moment. So instead of exiting the engine, the excess gases bypass to an electric generator? I presume this must be the MGU-H of the ERS system? Thanks for the insight. The hot air coming from the compressor is mostly from air compression and not really the hot turbine as you state. Also the intercooler is more for increasing density of air rather than to prevent knock. The density of air is what determines power in an engine, adding a turbo increases the pressure by say 2x, but only the density by 1.2x because it’s so hot. So adding an intercooler can bring it up to 1.5x which is when you start making power. Thanks for commenting, Owen. Really? Wow! I’ll change that little bit around. As for air density, I did mention this but perhaps I phrased it in that an intercooler was primarily to reduce knocking, which is incorrect. Regarding wording, in general, the terminology ‘turbine’ is not used for the compressor side. ‘Rotor’ is a good term for either spinning blade row. Thanks for the comment. Is that because it is being driven by exhaust side? Very interesting piece, and some useful comments too. On the ERS: they’re still using kinetic energy, so presumably this will be the heat source for the ERS? I wonder if Red Bull’s tight packaging and slight susceptibility to electrical reliability issues will cost them. I hope so (nothing against the team itself but I want some variety and a new driver/team champion would be good for the sport). ERS is made up of two components, MGU-H being the generator of one of them. This lies in the turbo unit. The turbine has a generator attached to it which harvests more energy as exhaust gas flow increases therefore there is no need for a wastegate, as the rotor will never over-speed. Red Bull will certainly have to compromise but as time passes things will become more compact and they could steal a small advantage.